This short statement was made by Dr. Ghada Karmi, a Palestinian professor emeritus at Exeter University, at the end of a ninety-minute debate between myself and a member of a Zionist lobby group called the NW Friends of Israel. Here is an excerpt from that debate. Zionist Hasbara oppose justice, oppose peace. When Israel’s ambassador to the U.K., Mark Regev, recently went on a speaking tour of U.K., universities he was received with protests that made it clear he was not welcome. In some cases, university entrances were actually blocked by students protesting. The universities themselves, however, had no issues with having the ambassador visit their campuses and speak to students. In other words, generally speaking, Israel and its representatives are not unwelcome and the state of Israel and Zionist spokespersons are generally welcome everywhere. Therein lies the problem. Whereas representatives of groups and organizations that preach racism and exercise violence — neo-Nazis, skinheads, proponents of apartheid, or any other supremacist group — would be less than welcome and it is not likely they would be allowed a platform, Zionism and the state of Israel are still viewed as legitimate and their point of view is still permitted a platform in academic institutions, in the media, and elsewhere. Although it is commonly thought by people who support the causes of justice and freedom in Palestine that we must boycott representatives of Israel and Zionism, if we wish to delegitimize Zionism and its agents, exposing them through debate in a public forum may in fact be a useful approach. The objective must be to dispel the myth that was promoted by the 1960 movie Exodus, which portrays Zionism and Israel as heroic and even romantic, and clearly demonstrate that Zionism is in fact an ideology that is racist, violent and has been destroying Palestine for over seven decades. That Israel, which was founded on Zionist ideology has been for seven decades engaging in a well-planned campaign of ethnic cleansing and genocide and has been imposing an apartheid regime on the indigenous people of Palestine. It may well be that a face-to-face debate makes the difference between the two sides more evident. In what may seem to be a paradox, the face-to-face encounter demonstrates that there is no room for dialogue or normalization and that there is no way to build a bridge between a racist, settler-colonial ideology that calls for the removal of a native people from their land, and the call for freedom, justice and equality. The arguments that support Zionism and seek to legitimize the state of Israel seem to rely heavily on talking points that are used over and over and which portray the oppressed and occupied people of Palestine as untrustworthy villains. It is followed by examples that demonstrate how incapable Palestinians are of governing themselves and that they dedicated to murdering Jews. These are very obvious, inaccurate, broad-stroke, racist characterizations of an entire people and they are repeated at every opportunity. “Look at the Palestinians,” they say, and they point to the chaos in which they live, leaving out the root cause of the chaos, which is the state of Israel having destroyed their country. The arguments that point out the racist nature of Zionism and Israel can be drawn from the very creation of the Zionist state and its definition as a Jewish state established on the ashes of Palestine. The fact is that Israel was able to establish itself only after an extensive campaign of ethnic cleansing — and the laws passed by the Israeli Knesset that made it impossible for the refugees to return and encouraged Jews from around the world to come and take their place. There is a history now, which is more than seven decades long, that shows beyond any doubt that the state of Israel is a racist settler-colonial endeavor and that it resorts to violence at every opportunity, even though Palestinians have never had a military force, never had as much as a tank or a warplane. Israel has a history of violating international law on many levels, perhaps the most obvious being the abuses of Palestinian human rights. All of this is easy to demonstrate when placed face to face with the Zionists and their arguments. While no dialogue and no normalization is acceptable with people who hold or represent a racist ideology, and while no platform should be provided to them, when faced with a well-oiled machine of public relations as is the case with Zionism, a public forum may well be the right place to expose them. 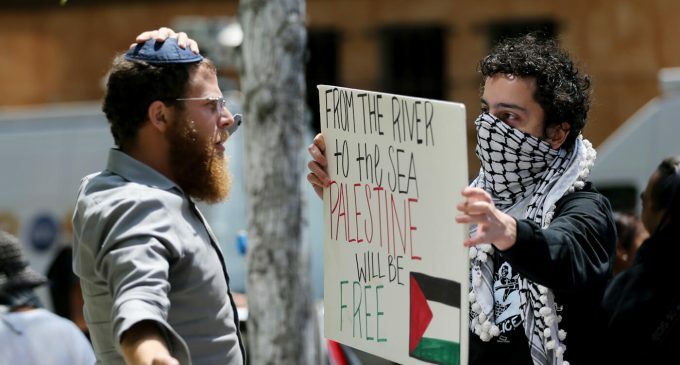 A public forum can be an opportunity to show that the question of Palestine is about a choice between racism and those who stand in opposition to racism. It is between violence and those who stand in opposition to violence. And it is about justice and those who stand in opposition to justice. The old bag of tricks that was brought by agents of the Zionist propaganda machine, when set against the arguments for justice, freedom and equality will fail every time. Repeating this failure may well be how we delegitimize Israel and the ideology behind it, Zionism. The post Arguing with Zionists in Public: The Necessity of a Debate that Offends and Appalls appeared first on MintPress News.